Perhaps the ultimate potato salad to be served at room temperature and not chilled, this German Potato Salad is the perfect addition to any cool season meal. I usually make this recipe from memory so when I made the recipe last night to serve with our Tony Packo hot dogs I was sure to measure ingredients so I could share. My family likes this dish served with sausage or on the side of a warm Ruben sandwich. Whatever you serve this with be sure to use the Yukon Golden Potato variety. Below you will find the super easy ingredients and how to create. Be sure to take advantage of the printable recipe option and add this to your cookbook for your family to enjoy. Bring to boil 6 cups of water. 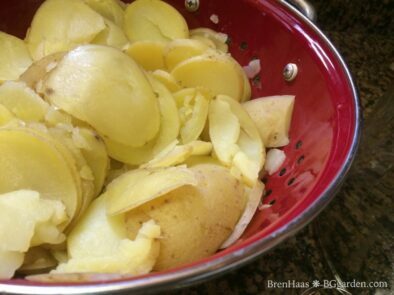 Add sliced and cleaned Yukon Gold Potatoes. Once potatoes are cooked drain water. In skillet fry up bacon. 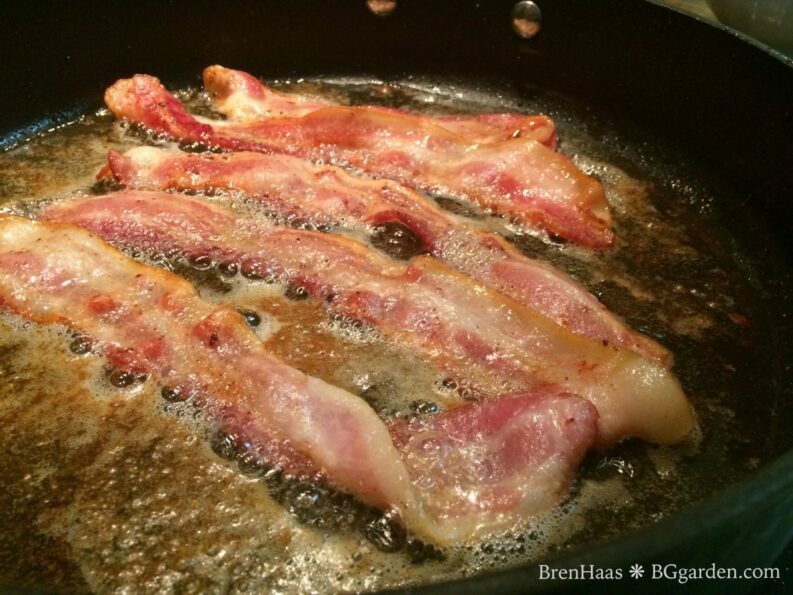 Drain all but 4 tablespoons of bacon grease after removing the bacon. Chop bacon and put on side. Saute diced onions in the bacon grease for about 5 minutes. Add onions to the drained potatoes. 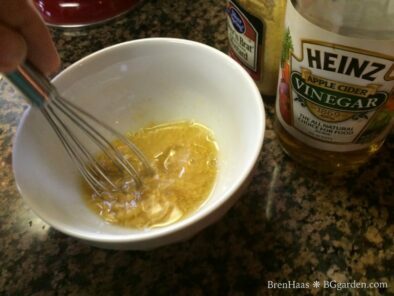 In bowl add vinegar, sugar and Dijon mustard mixing. Pour mix over the potatoes in serving dish and gently fold in bacon pieces. This is a super easy recipe… I’d love to hear what your favorite German themed dishes are so please comment below. Hot German potato salad was my dear husband’s favorite potato salad. I miss cooking and doing so many things for and with him. Does this recipe taste similar to the salad at Tony Packos? I created this because I was craving the Tony Packos german potato salad. It taste as close as I can get it! I’d love to hear if you try it and any suggestions you may have. Thanks for responding, Bren. My wife and I love the German Potato Salad at Tony Packos. We’ll probably give this a try next weekend – I’ll let you know the results!